Crocus are one of the first flowers to bloom each spring, with blossoms that often open when there’s still snow on the ground. Their cheery flowers come in Easter egg colors of purple, yellow, lavender, cream and white. Crocus are carefree bulbs that naturalize and multiply to produce more flowers every year. These beautiful blossoms are magnets for hungry bees, who are drawn to the rich, golden pollen inside each flower. When you compare two crocus bulbs side by side, it’s easy to see differences in quality. Larger bulbs, like the one shown on the far left, contain more food energy to fuel the future plant’s growth. These bulbs will produce stronger plants with more flowers. 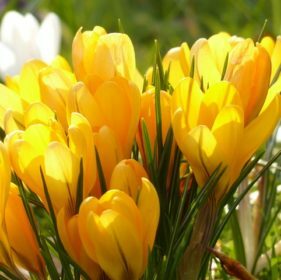 Crocus grow from corms (not true bulbs) but for ease they are usually referred to as bulbs. Crocus can flower any time from late winter to early spring. The buds are stemless and emerge directly from the soil at the same time as the foliage. One day there will be no sign of them and the next day they may be blooming! Each bulb will produce several blossoms in quick succession. Since the flowers don’t have a stem, crocus are not suitable for cutting. But you can enjoy their fleeting beauty outdoors and have fun watching bees eagerly gathering the golden-yellow pollen. Snow and extreme cold can damage crocus blossoms that are already open but this will not affect the bulb or future flowers. Once crocus bulbs have finished flowering, there’s no need to remove the spent blossoms as they will quickly fade away. Let the foliage continue growing. After a few weeks the leaves will have yellowed and faded away. If you plant crocus bulbs in your lawn, hold off on mowing the area until the bulb foliage begins to wither. This will give the bulbs the time they need to store energy for next year’s flowers. Over time, large clusters of crocus may become overcrowded and produce fewer flowers. If this happens, dig up the bulbs shortly after they finish flowering (so you still know where they are). Divide the bulbs into smaller clusters and replant the same area with at least 6” of space between each cluster of bulbs. Plant extra bulbs in new places or share them with friends.